To avoid plagiarism by giving credit to the original source of an idea, piece of information or resource. To support your work with the authoritative work of another author. To demonstrate your knowledge and familiarity with a topic that you have researched. To help readers of your work to find the original source of information or ideas that you have used. Any quoted text - use quotation marks whn directly using someone else's words. Any idea or information paraphrased or summarised from a source which is not common knowledge. As you do your research, keep a list of all the sources that you use. You need to record specific information for each source - this is called the citation. Keeping a record of these details will help you to find the source again if you need to refer to it, and will also form the basis of your reference list. 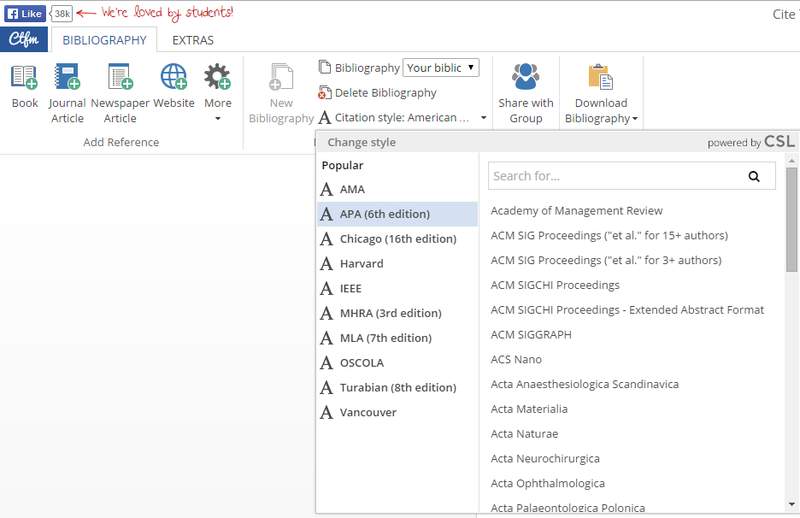 It will even collect and collate a downloadable Bibliography for you. ReferencesCite This For Me, (2014). Cite This For Me: Automatic bibliography generator. [online] Available at: https://www.citethisforme.com/cite/website/autocite [Accessed 8 Sep. 2014]. Cite.auckland.ac.nz, (2014). Referencite - Why do you need to reference?. [online] Available at: http://www.cite.auckland.ac.nz/index.php?p=why_reference [Accessed 8 Sep. 2014]. Learnonline.canberra.edu.au, (2014). Referencing: Why do we have to 'reference' at university?. [online] Available at: http://learnonline.canberra.edu.au/mod/book/view.php?id=180722 [Accessed 8 Sep. 2014]. Newcastle.edu.au, (2014). Building A Strong Foundation For University Life | Referencing - What Is Referencing?. [online] Available at: http://www.newcastle.edu.au/service/library/foundation-portal/referencing-whatis.html [Accessed 8 Sep. 2014]. Rosemary Clerehan, T. (2014). Why do we reference. [online] Monash.edu.au. Available at: http://www.monash.edu.au/lls/llonline/writing/general/reference/index.xml [Accessed 8 Sep. 2014]. Skillsyouneed.com, (2014). Academic Referencing - How to Cite & Reference | SkillsYouNeed. [online] Available at: http://www.skillsyouneed.com/write/academic-referencing.html [Accessed 8 Sep. 2014]. Www2.gsa.ac.uk, (2014). Why Reference?. [online] Available at: http://www2.gsa.ac.uk/library/infosmart/infosmart-cite/infosmart_06.htm [Accessed 8 Sep. 2014].